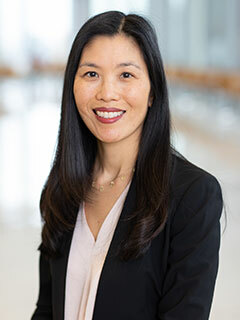 Stella T. Chou, MD, is an attending physician in the Division of Hematology and the Apheresis Program at The Children's Hospital of Philadelphia. Dr. Chou's research laboratory investigates mechanisms of normal hematopoietic development and how these become disrupted in hematologic diseases. Her laboratory primarily uses induced pluripotent stem cells (iPSCs) and primary human cells to model blood diseases and study their underlying pathophysiology. They specifically focus on erythro-megakaryocytic development and the role of genetic modifiers in anemia, thrombocytopenia, and myeloproliferative disorders. Dr. Chou's other research focus is alloimmunization in patients with sickle cell disease. Her research has demonstrated that transfusion of patients with sickle cell disease using African American donor units and antigen matched for D, C, E, and K did not reduce Rh alloimmunization and many Rh antibodies were explained by inheritance of variant RH genes. Her current work focuses on alloimmunization prevention and transfusion safety for patients with SCD using genomics to identify risk of alloantibody formation and selecting compatible blood donors. Zhang H , Xue C , Shah R , Bermingham K , Hinkle CC , Li W , Rodrigues A , Tabita-Martinez J , Millar JS , Cuchel M , Pashos EE , Liu Y , Yan R , Yang W, Gosai SJ , VanDorn D , Chou ST , Gregory BD , Morrisey EE , Li M , Rader DJ , Reilly MP. Functional Analysis and Transcriptome Profiling of iPSC-derived Macrophages and their Application in Modeling Mendelian Disease. Circ Res. 2015 Jun 19;117(1):17-28. Westhoff CM, Vege S, Halter Hipsky C, Horn T, Hue-Roye K, Keller J, Velliquette R, Lomas-Francis C, Chou ST, Reid ME. RHCE*ceAG (254C>G, 85Gly) is prevalent in Blacks, encodes a partial ce-phenotype, and is associated with discordant RHD zygosity. Transfusion. 2015 Nov;55(11):2624-32. Noh JY, Gandre-Babbe S, Wang Y, Hayes V, Yao Y, Gadue P, Sullivan SK, Chou ST, Machlus KR, Italiano JE Jr, Kyba M, Finkelstein D, Ulirsch JC, Sankaran VG, French DL, Poncz M, Weiss MJ. Inducible Gata1 suppression expands megakaryocyte-erythroid progenitors from embryonic stem cells. J Clin Invest. 2015 Jun;125(6):2369-74. Wang Yuhuan, Hayes Vincent, Jarocha Danuta, Sim Xiuli, Harper Dawn C, Fuentes Rudy, Sullivan Spencer K, Gadue Paul, Chou Stella T, Torok-Storb Beverly J, Marks Michael S, French Deborah L, Poncz Mortimer: Comparative analysis of human ex vivo-generated platelets vs. megakaryocyte-generated platelets in mice: A cautionary tale. Blood Apr 2015. Casas Jessica, Friedman David F, Jackson Tannoa, Vege Sunitha, Westhoff Connie M, Chou Stella T: Changing practice: red blood cell typing by molecular methods for patients with sickle cell disease. Transfusion Jan 2015. Chou Stella T, Jackson Tannoa, Vege Sunitha, Smith-Whitley Kim, Friedman David F, Westhoff Connie M: High prevalence of red blood cell alloimmunization in sickle cell disease despite transfusion from Rh-matched minority donors. Blood 122(6): 1062-71, May 2013. Gandre-Babbe Shilpa, Paluru Prasuna, Aribeana Chiaka, Chou Stella T, Bresolin Silvia, Lu Lin, Sullivan Spencer K, Tasian Sarah K, Weng Julie, Favre Helene, Choi John K, French Deborah L, Loh Mignon L, Weiss Mitchell J.: Patient-derived induced pluripotent stem cells recapitulate hematopoietic abnormalities of juvenile myelomonocytic leukemia. Blood 121(24): 4925-9, April 2013. Friedman DF, Keller MA, Vege S, Jackson T, Chou ST, Westhoff CM: Automated RH genetic matching applied to African American donors and patients with sickle cell disease. Transfusion 2014 Notes: American Association of Blood Banks Annual Meeting, Philadelphia, PA.
Chou ST, Keller MA, Jackson T, Vege S, Friedman DF, Westhoff CM: Red cell RH genotype matching for Rh alloimmunized patients with sickle cell disease. Transfusion 2014 Notes: American Association of Blood Banks Annual Meeting, Philadelphia, PA.
Chou ST, Friedman DF, Jackson T, Vege S, Keller M, Westhoff CM: Feasibility of RH genetic matching for patients with sickle cell disease with an African-American donor pool. Blood 2014 Notes: American Society of Hematology Annual Meeting, San Francisco, CA. Yuhuan Wang, Vincent Hayes, Prasuna Paluru, Stella Chou, Deborah L. French, and Mortimer Poncz: Insights into thrombopoiesis from infused human megakaryocytes. Blood December 2013. MA Keller, J Crowley, T Horn, R Young, S Hondorp, D Friedman, CM Westhoff, ST Chou: Characterization of RH locus in African American Blood Donors. Transfusion Oct 2013. Hanrui Zhang, Christine Hinkle, Wenli Yang, Daniel VanDorn, Stella Chou, and Muredach P. Reilly : Efficient Differentiation And Polarization Of Macrophages Differentiated From Human Peripheral Blood Mononuclear Cells-derived iPS Cells. Arteriosclerosis, Thrombosis, and Vascular Biology 33(5), May 2013. Chou ST, Schreiber AD: Autoimmune Hemolytic Anemia. Nathan and Oski's Hematology of Infancy and Childhood. Orkin SH, Nathan DG, Ginsburg D, Look AT, Fisher DE, Lux S. (eds.). Elsevier, 2014. Chou ST, Westhoff CM. : The Rh System. The American Association of Blood Banks Technical Manual. Roback JD, Combs MR, Grossman BJ, Hillyer CD (Eds). (eds.). AABB: Bethesda. 2011. Chou ST, Weiss MJ. : Nonimmune Hemolytic Anemia. Conn's Current Therapy. Rakel R, Bope E (Eds). (eds.). WB Saunders, 2007. Chou Stella T, Weiss Mitchell J: Diseased red blood cells topple iron balance. Nature medicine 13(9): 1020-1, Sep 2007. "Alloimmunization in Sickle Cell Disease: Current and Future Prevention Strategies", St Jude Children's Research Hospital Grand Rounds, Memphis, TN, July 2015. "Red cell therapy for sickle cell disease: is there are perfect match?," Invitational Conference of Investigative Immunohematologists, Grafton, IL, June 2015. "Alloimmunization in sickle cell disease: current and future prevention strategies," American Society of Pediatric Hematology Oncology 28th Annual Meeting Education Session, Phoenix, AZ, May 2015. "Alloimmunization and delayed hemolytic transfusion reactions in sickle cell disease." Emirates Hematology Conference 2015 Education Session, Dubai, UAE, March 2015. "Challenges of alloimmunization in patients with sickle cell disease" Second Global Congress on Sickle Cell Disease, Rio de Janiero, Brazil, November 2014. "Alloimmunization in sickle cell disease and thalassemia: strategies for better prevention", 8th Annual Sickle Cell and Thalassemia Advanced Conference, Guy's and St Thomas' NHS Foundation Trust, London, UK, October 2014. "Need for uncommon donors for patients with sickle cell disease", American Association of Blood Banks Annual Meeting Education Session, Philadelphia, PA, October 2014. "The untransfusable patient", NHLBI Sickle Cell in Focus, Bethesda, MD, September 2014. "Alloimmunization in sickle cell disease: insights from molecular typing", Doris Duke Charitable Foundation Symposium on Sickle Cell Disease: Challenges and New Treatment Options, New York City, NY, September 2014. "Plasma and blood cell pheresis therapies", American Society of Pediatric Hematology Oncology 27th Annual Meeting Education Session, Chicago, IL, May 2014. "Transfusion therapy for sickle cell disease: diversity, donors, and dilemmas," Nationwide Children's Hospital Hematology-Oncology Seminar Series, Columbus, OH, April 2014. "Complications of transfusion therapy in sickle cell disease", Global Iron Summit, Athens, Greece, March 2014. "Serological and molecular analysis of alloimmunization," Cincinnati Children's Hospital Symposium on Alloimmunization in Sickle Cell Disease, Cincinnati, OH, March 2014. "Role for the GATA1 amino terminus in erythroid differentiation revealed through patient-derived induced pluripotent stem cells", Diamond Blackfan Anemia International Consensus Conference, Atlanta, GA, March 2014. "Transfusion therapy for sickle cell disease: where we are." Albert Einstein Medical Center Pediatric Ground Rounds, Philadelphia, PA, January 2014. "Transfusion therapy in sickle cell disease: a balancing act", American Society of Hematology Annual Meeting Education Session, New Orleans, LA, December 2013. "Red blood cell genotyping for sickle cell disease: diversity, donors, and dilemmas", New York Blood Center 50th Anniversary Symposium, New York City, NY, November 2013. "Characterization of the RH locus in African American Blood Donors", American Association of Blood Banks Annual Meeting, Denver, CO, October 2013. "Patient-derived IPS cells reveal a role for the GATA1 amino terminus in erythropoiesis", Progenitor Cell Biology Consortium, Minneapolis, MN, October 2013.